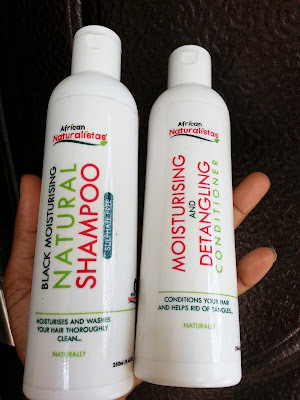 This is a review of a pair of products from an Indigenous brand, #ProudlyNigerian African Naturalistas. I won them both last year when AN was rewarding top commenters on their blog. I had no idea I had commented that much and I was pleased. I didn't buy them, but I wasn't given these products in my capacity as a blogger to review. I won them as a random reader of their blog. Nevertheless, I will always give my sincere opinion based on my real experiences with products, no matter how I happen upon them. Now that we have been assured of the absence of mago-mago, let's go on to the review. Price and packaging N1700 for each. White plastic squeeze bottles with clear labels. Simple works. Smell I had a hard time placing the smell. It smelled orangey but not like the fruit. It was from AB's review I finally recognised it as Vitamin C tablet smell. It's sharper in the conditioner than in the shampoo. Colour and Consistency shampoo is a very light beige. Thick but free flowing. The conditioner is thicker and white. The ingredient list is very friendly but being lil Ms Organic, I was concerned about Euxyl so I looked it up. It's a preservative that's considered much safer than parabens, formaldehyde. You have to preserve your stuff somehow. Can't combine water and edible stuff and not expect microbes to take up residence if you don't add something to stop them. Better Euxyl than a bacteria colony. Another concern was fragrance. It didn't say whether natural or synthetic but I didn't want that to stop me from using it. I've made giant strides going organic but I still use perfume. I still want to know though. Moisturising Shampoo: Long story short, amazing. It doesn't really lather. The first time I used it, it was all creamy as I worked it into my scalp and I thought "this should be called Cleansing Cream or something". I wasn't expecting it to really wash my hair and scalp. I rinsed out and Lord it cleans! No need to repeat so the bottle really lasts. My scalp was as fresh as freshly minted bank notes. And my hair? It was soft chaiii. The product delivers every single time. Perfect balance. 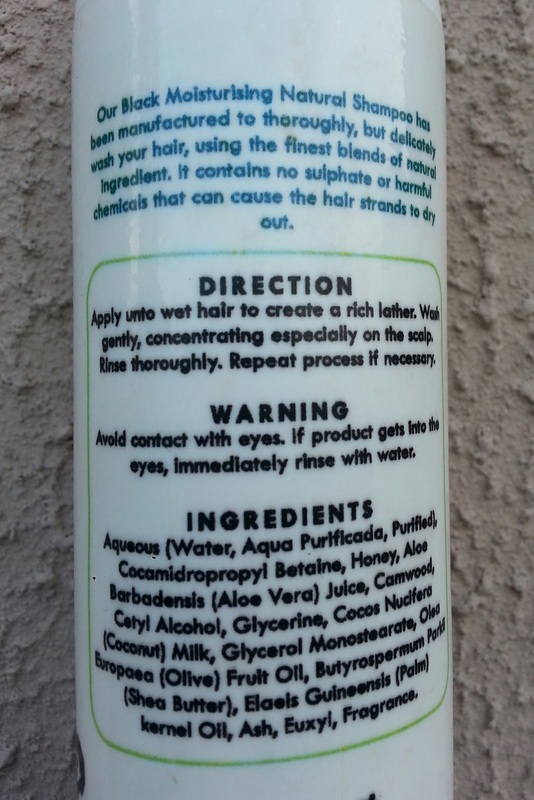 Moisturising And Detangling Conditioner: It's their rinse-out conditioner and I used after shampooing as directed. It has real nice slip and made detangling a breeze. Once I rinsed however, it was all gone. I didn't get any extra moisture and my hair didn't feel like I had used anything. Adding more didn't change a thing. I was less impressed than with the shampoo. I've used up 2/3 of the shampoo and all of the conditioner. The shampoo is top notch and has become a staple for me. It is consistent, cleans thoroughly and leaves my hair soft and moisturised, at a really good price. The conditioner has been a good detangling aid but a girl got moisture needs. A definite yes to the shampoo. The conditioner- Maybe. I've not had issues with tangles but if I developed them and needed an extra conditioner with slip I could buy this. If you know of any other site/store that sells these, please include in the comments below. Mwah! Lovely post! 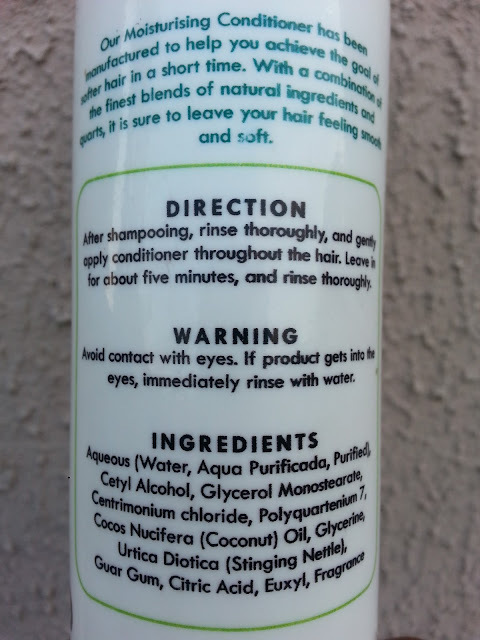 The shampoo sounds great but so disappointing to hear the Conditioner left no moisture. Thanks for the review Sandra. If there's anything we have learnt in this cosmetic business, it is that one size does not fit all, Our conditioners are used in many natural hair salons in Nigeria. However, we would like to state that we have improved upon the formulation of most of our products this year. They were good before, but now, they are even better. Right? That shampers is amazingggg! I wish it lathered better though. I like to see my suds! I missed the lather at first but now I don't even care. I actually like that it doesn't cos it registers in my head as much gentler without suds.